A record 42 countries are lining up to compete for musical glory at this year's Eurovision Song Contest in Helsinki. The competition, now in its 52nd year, regularly throws up some surprises, a little controversy - and plenty of colour. A comedy drag act, a flourish of opera, and the legacy of last year's monster rock winners Lordi are just a few of the ones to watch in Finland. Ukraine, who won Eurovision in 2004 with fur and leather-clad star Ruslana, are pinning their hopes in Helsinki on Verka Serdyuchka. The middle-aged self-styled "megastar", who dresses extravagantly with a silver star perched on top of her head, is in fact the creation of male comic Andriy Danylko. The 33-year-old composed the song Dancing Lasha Tumbai, a zany, high-octane tune with lyrics in English, German, Russian, Ukrainian and Mongolian - which his alter-ego has declared an "ode to peace and love". The drag queen's presence at Eurovision has angered a number of Ukrainian nationalists, who find her vulgar and an insulting parody of village folk - but she remains popular across the former USSR. Denmark also voted for a female impersonator to represent the country at the Eurovision Song Contest. But in stark contrast to Verka Serdyuchka, Peter Andersen's drag creation DQ is a vision of sequins, feathers and glamour, with a disco song which might be described as absolutely fabulous. 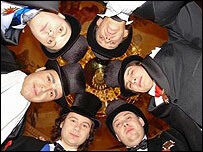 Slovenian trio Sestre were the most recent cross-dressing act to grace the Eurovision stage in 2002, finishing in 13th place. Two of this year's Eurovision entrants are making a high-brow bid for Eurovision victory. Latvia are resting their hopes on an ensemble of six tenors in the mould of the internationally successful group Il Divo, and were formed especially for the song contest. Their name, Boniparti.lv, is a reference to Napoleon, who was mentioned in Abba's famous 1974 Eurovision victory, Waterloo. And like any self-respecting opera artists, their song Questa Notte will be performed entirely in Italian, and is tipped to strike a chord with the contest's older voters. 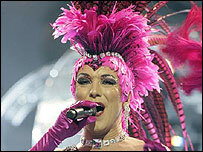 Slovenia have failed to progress from Eurovision's qualifying round since it was introduced in 2004. The country has turned its back on pop, choosing to send soprano Alenka Gotar to Helsinki, who will reach for the top notes with her song Cvet z Juga. But the singer has yet to give up the day job - in the run-up to Eurovision, she was in Japan performing Delibe's Lakme with Slovenia's Maribor Opera and Ballet company. The two countries must hope their fortunes do not emulate Turkey's 1983 entrant Cetin Alp, whose song Opera finished last with no points. It was Finland's "day of rockoning" at the Eurovision Song Contest last year when hard rock monsters Lordi romped to victory. While no country has dared copy their frightening masks and devilish costumes, several have decided that rock music is the key to capturing victory this year. Host nation Finland has stuck with the rock theme, with Hanna Pakarinen singing the edgy, slightly miserable goth-pop song Leave Me Alone. Neighbouring Sweden has opted for a slice of upbeat, glam rock from The Ark, a flamboyant band with an androgynous, openly bisexual lead singer. Tiny Pyrenean principality Andorra is offering another take on rock, with teen punk band Anonymous hoping to lift the country into their first grand final with an energetic plea to save the world. At the other end of the age scale, Croatia voted to send Dragonfly along with popular veteran rocker Dado Topic, who at 57 is one of the oldest artists ever to grace the Eurovision stage. Monster rockers Lordi caused a storm of controversy in 2006, being branded as Satanists by some groups. The attention they received may have helped them to a famous victory. Earlier this year in Switzerland, local star and Eurovision hopeful DJ Bobo sparked a row with his song Vampires Are Alive. Some evangelical groups organised a petition against their country's entry, arguing the song would encourage occultist practices and even suicide. Lyrics including "from heaven to hell, enjoy the ride... you're here to surrender with your life" fuelled the claims. DJ Bobo has called the song a fairytale, while it soared to the top end of the Swiss charts. This year's explosive entry from Israel, Push The Button, has been interpreted as containing references to Iran's nuclear programme. But the multi-lingual song was passed by Eurovision chiefs, who are careful to ensure that contest entries do not contain any political messages, while performers Teapacks declared they were "not a political group". Eurovision performers regularly return for another whiff of musical glory, and 2007 is no exception. Eirikur Hauksson from Iceland was a member of the group Icy, the country's first Eurovision entrant in 1986, and represented Norway five years later as part of Just 4 Fun. Evridiki from Cyprus is also hoping for third time lucky, after doing the honours in 1992 and 1994. Her latest song will curiously be sung entirely in French. Edsilia Rombley from the Netherlands will hope to steer her country into the grand final for the first time since 2004. Her fourth place in 1998 remains the best Dutch result since their victory in 1975. Karolina Goceva will represent FYR Macedonia for the second time in five years, aiming to gain the country a Top 10 finish for the first time. Each of the veterans will have to qualify from the semi-final, in which 28 countries will be battling for just 10 berths in 12 May's grand final. The Eurovision family continues its expansion with two new countries taking to the stage for the first time this year. The former Soviet republic of Georgia pushes the contest's boundaries eastwards, with local star Sopho Khalvashi holding the honour of becoming the country's debut performer. A nation closer to the heart of Europe which has shied away from competing until now is the Czech Republic. The Czechs, who have always cited financial difficulties for their absence, are pinning their hopes on veteran rock band Kabat. Serbia and Montenegro will be taking part for the first time in their own right, after Montenegro became independent last year. As a united state, the country came second on their debut in 2004, and finished seventh the following year. Serbia is tipped to do well with acclaimed local singer Marija Serifovic, with the country likely to pick up votes from its numerous Balkan neighbours. The semi-final of the Eurovision Song Contest takes place on 10 May and will be screened on BBC Three at 2000 BST. The grand final, on 12 May, will be shown on BBC One from 2000 BST.